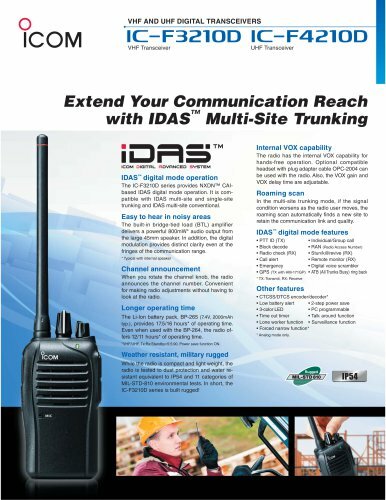 Extend Your Communication Reach with IDAS™ Multi-Site Trunking Internal VOX capability IDAS™ digital mode operation The IC-F3210D series provides NXDN™ CAIbased IDAS digital mode operation. It is compatible with IDAS multi-site and single-site trunking and IDAS multi-site conventional. Easy to hear in noisy areas The built-in bridge-tied load (BTL) amplifier delivers a powerful 800mW* audio output from the large 45mm speaker. In addition, the digital modulation provides distinct clarity even at the fringes of the communication range. * Typical with internal speaker Channel announcement When you rotate the channel knob, the radio announces the channel number. Convenient for making radio adjustments without having to look at the radio. Longer operating time The Li-Ion battery pack, BP-265 (7.4V, 2000mAh typ. ), provides 17.5/16 hours* of operating time. Even when used with the BP-264, the radio offers 12/11 hours* of operating time. *VHF/UHF, Tx:Rx:Standby=5:5:90. Power save function ON. Weather resistant, military rugged While the radio is compact and light weight, the radio is tested to dust protection and water resistant equivalent to IP54 and 11 categories of MIL-STD-810 environmental tests. In short, the IC-F3210D series is built rugged! The radio has the internal VOX capability for hands-free operation. Optional compatible headset with plug adapter cable OPC-2004 can be used with the radio. Also, the VOX gain and VOX delay time are adjustable. Roaming scan In the multi-site trunking mode, if the signal condition worsens as the radio user moves, the roaming scan automatically finds a new site to retain the communication link and quality. IDAS™ digital mode features • PTT ID (TX) • Block decode • Radio check (RX) • Call alert • Emergency • GPS (TX with HM-171GP) • Individual/Group call • RAN (Radio Access Number) • Stun/kill/revive (RX) • Remote monitor (RX) • Digital voice scrambler • ATB (All Trunks Busy) ring back Other features • CTCSS/DTCS encoder/decoder* • Low battery alert • 2-step power save • 3-color LED • PC programmable • Time out timer • Talk around function • Lone worker function • Surveillance function • Forced narrow function* * Analog mode only.